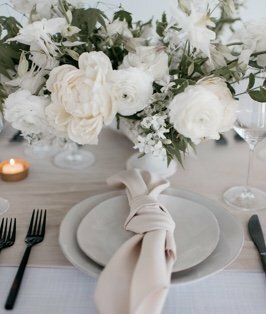 A restrained color palette and handcrafted fretwork, Silver Angelina table linen is stylish, versatile, and feels so effortless. You can use this unique table linen as the foundation or addition for any event table, providing an appealing and elegant design for nearly any special occasion. Combine it with others in the Everlast Kehoe Collection, a collection of our Designer Series, to create a unique and stylish look that leaves you and your guests impressed.